I know that thanksgiving is right around the corner, but it is not too late to host your Thanksgiving themed bunco party! I recently had a request to design a deluxe Thanksgiving Bunco Decoration set and I jumped at the chance. This matches my standard bunco set and separate invitation, but adds in a few more goodies. Here is what is included in the deluxe set & how to set up the items once printed! These are set up two per page. Once printed Cut down the middle to 5.5×8.5″. These are set up two per page. Once printed, cut the page down the middle to 5.5×8.5″. Then fold the cards in half to make free-standing tent cards. These are set up two per page. Once printed, cut the page down the middle to 5.5×8.5″. Then fold the cards in half to make free-standing tent cards. These are blank so you can use a nice pen or marker to write the name of the dish on the card. These are set up two per page. Once printed Cut down the middle to 5.5×8.5″. Use a nice pen or marker to write your event details. 3 per sheet. Cut along crop marks. Remove existing labels on water bottles. Then just tape them around your water bottles! These are set up 8 per page. There are dotted lines to cut along. Then use a hole punch to punch out the center hole. Use ribbon or twine to attach to goodie bags or gifts. This is a banner set up one letter per page. There are cut lines once you have printed all pages to follow. There are many ways to string the banner. My favorite is using a hole punch on the top corners and weaving the ribbon in and out. That way you can disassemble it easily to put away. These have dotted lines to cut along. They can be a little tricky! So take your time! They are set up 12 per page so you have a few to spare. Use a nice pen or marker to write your name and mark your wine glass. Last but not least, this theme has a free matching US/THEM tally card. This is not included in the purchased set and you must download it here. 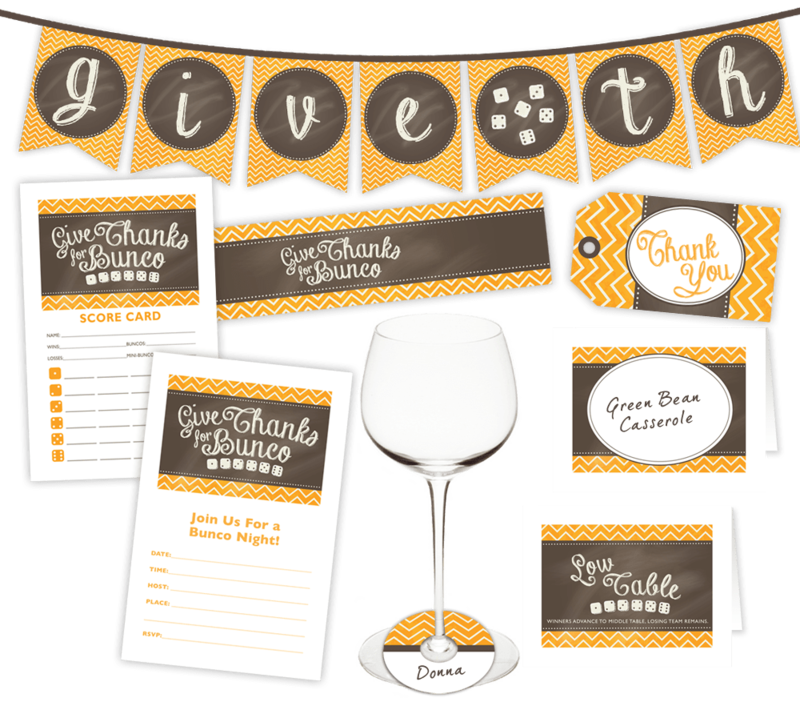 Check out our Thanksgiving Bunco Theme Party page for more inspiration!